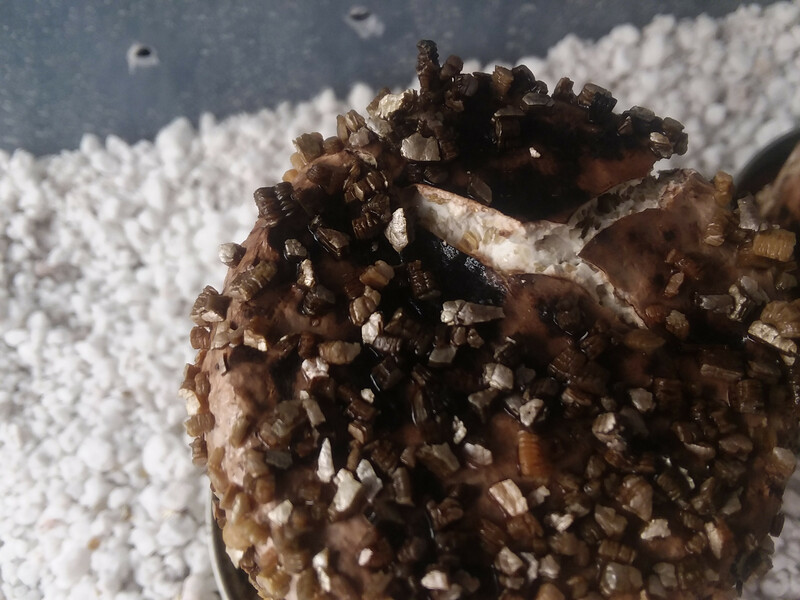 That's an interesting idea, using pf tek and just quickly embedding some healthy tissue near in the top layer of vermiculite. That could be a good way to reproduce use stem butts. Chop off that tough end of your mushrooms, store them in the fridge for a day, make up some PF jars and just quickly slide a piece in there. Alternatively you could take spore prints from your mushrooms, get some veterinary syringes from the local farm supply store, and make some spore syringes. Your cakes look colonized and healthy, congrats! I think they usually turn all brown on the outside before they fruit. Best of luck keep us posted. I have some Kuehneromyces mutabilis on grain at the moment. It's not one I would eat from the wild since it resembles the deadly poisonous Galerina genus, but eating my own homegrown should be an interesting experience. lol Yea I realized I was a bit impatient with the fruiting, but ah well. They are barking, and going to fruit soon hopefully anyway. All is going according to plan. Hopefully I will see fruits soon. well SHIITake mushrooms, guess they dont really need the wood then huh? Ah, dont forget! These were inoculated with 3 dowels each jar. So thats the Only wood source in the jar. They seem to love the BRF though. This was really fun, really cheap, and really easy to do. As any other method though, there can be amends, and things can be progressed more efficiently. One day I may continue this and see what else I can do to make this work. I wonder how these fruits will look, whether itll be a good/standard flush or stunted/dwarfed somehow, small fruits, low yield, etc. but looks good so far! if you get a good flush, the next thing id do is clone a fruit or somehow get the culture on agar (you just have it on dowel plugs right? and tossed a few dowel plugs in your PF jars? ), repeat without the dowels, and see if it can truly fruit without the wood. if they fruit without wood, thats good news, then folks can do PF tek all day. if they do not fruit, well thats also news, we know that the minimum wood needed is <= 3 dowel pieces per cake, which is seems low. should also do a comparison with the same clone on a more wood-based substrate, at some point when you have the means. with a PC, one could easily modify PF cakes by subbing in sawdust or wood shavings for half or all the verm. maybe you will end up with what APPEARS to be a good yield from your jars here, but would be interesting to actually compare how that clone does on strait wood. It should be fully fruited soon, maybe in the morning or tomorrow evening. The other cakes have some more pins opening up on the sides as well. The only cake not doiing anything is the one I didnt dunk, but it looks exactly the same as the others, minus some weight. The cold shock dunk seemed to be the catalyst after barking that made them fruit. Id love to see someone elses proper BRF shiitake experiment so I can compare! Also since I dont own a PC yet, Ive been messing with this brown rice flour agar substitute. I basicaly just took brown rice flour, mixed it with water and sauted it until it was thick. I added a little pumpkin seed oil to it at the end, titrated in small amounts until desired texture was achieved. I was able to tilt the pan 90* and it would only jiggle without sliding out. I loaded each jar with about one spoon full of the paste, and then steam bathed them with covered lids for 90 minutes before injecting with spores. Over a week later the mycelium is crawling up the walls of the jar now with nice rhyzo strands, and very puffy forms in the middle of the jar. Ill use this same technique for the dowels probably lol. In fact in my plug spawn bag there are tiny grains covered in mycelium attached to the plugs. Ill just drop one or two into my 'agar' jars and see what happens.